Since 2003, Gautier Serre has crafted an experimental music identity comprising myriad nuanced influences. His primary project is Igorrr, which aims to seek harmony within the classical and modern. Its sound comprises a heavy metal foundation accentuated by baroque, jungle and industrial flesh tones, which are often utilized collectively in a single song. This combination creates a truly individualized listening experience – a solid effort spanning three EPs and a half-dozen albums, each more expansive and diverse than its predecessor. 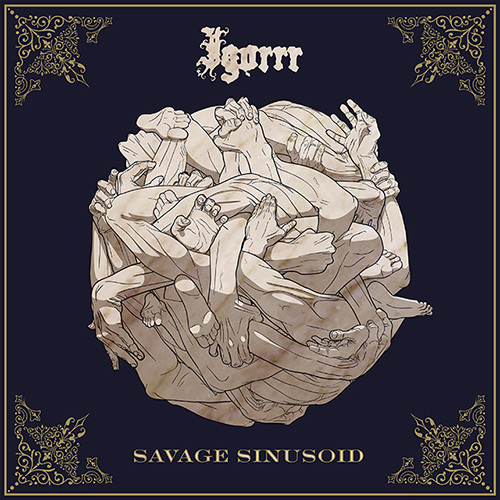 His latest album under Igorrr, titled Savage Sinusoid, is the sixth consecutive album to be released within a two-year span. The album has since excelled not only given its Metal Blade distribution, but its ability to break further stylistic boundaries even with such a well-established template. Right off the bat, “Viande” highlights one of Igorrr’s most harnessed tactics—surprise. The initial outright screams can be taken at face value, as they are followed by an equally blunt, dark riffing sequence. However, the subtler implementation starts once the screams become chopped and skewed. Gradually, the riffs and percussion then mutate into another form, based on an electronic, glitch-laden edge. On the following track, “ieuD,” there’s substantial implementation of dynamics throughout its progression, beginning with its base harpsichord melody. The vocals are initially big and projected. Just before the 50-second mark, however, they become increasing unhinged. A pained, intense inflection overcomes the singer’s delivery, which is capped by a starkly pronounced drop. From there, waves of fragmented percussion accumulate into a haze of extreme metal pace. The succeeding female vocals complement the male in a similar operatic fashion, except not as abruptly and with a more graceful flow. “Houmous” carries that intensity over in the form of a polka-meets-thrash stampede. The effect was so spot-on that I was thrown off, thinking another album might have slipped in between my playlist of songs. Based on this particular song’s sequence, I began sensing a real element of fun in regard to Serre’s creative process; he simply lets his elemental scope run unbridled, making genres that are otherwise as far removed from one another blend smoothly. The percussion seamlessly shifts between straightforward, heavy thump to a gabber-inspired distortion. Another critical aspect that works to the song’s benefit is the breakdowns beginning around the first minute and a half, which opportunely increase in impact once those elements settle in. On “Opus Brain,” the electronic spike resonates cleanly, even though its dynamics are slightly less pronounced than the previous tracks. Beneath its breakbeat-driven foundation, the artifacts that subtly envelop the beats hold everything together surprisingly well. At the halfway point is where things take a familiar detour. Upon an oriental bridge, the female vocals undergo a gradual shift, from purely operatic to a kind of knife-like hard rock approach. As they crack into a scream, the extreme metal vibe returns in a backdrop of equally heightened overdriven guitars. Although not yet the capping point, “Probleme D’emotion” breaks the heaviness in a nearly-all acoustic skeleton. Consisting mostly of mournful strings and piano chords, the song comes across as a quite soothing departure from all the stylistic curveballs thus far. That is until later on, when grand electro kicks seep into the atmosphere, elevating a mesh of bubbling dubstep fuzz, and ending the track on a void. Up until the midpoint, I’d thought of the sequencing of the tracks as alluding to a downward emotional spiral. “Spaghetti Forever” seems to continue that notion, as it starts with a beautifully woven Spanish guitar sequence, but eventually corrodes into one featuring up-tempo, murderous screams. To a degree, this can represent the evolution of habitual behavior into full-blown addiction. It starts out pleasant, like a go-to detractor from internal anguish, only to slowly destroy its user over time. Between even occasional lapses, represented by violins, each fallback (or dense guitar chugging) proves more powerful—and crippling—than the last. By “Cheval,” the polka thrash stampede makes a welcome return to briefly offset the album’s predominant somber tone. This time, a deep, funky bassline provides the primary accompaniment, and is accentuated with each triplet. The wideness of the subsequent guitars is so much so that it comes across as out of place, especially with the screaming vocals. It’s not bad by any means; just humorous to a fittingly unexpected and campy effect. Undeniable merit is carried through the songs gradual extremeness, particularly once the screams increase in half steps without falling off key. The transition between those blood curdling screams and clean singing retains a level of aptitude, as well as the tongue-in-cheek method of execution. More subtly, the deeply distorted percussion follows thereafter in an analogous manner. However, what exclaims this direction is the strangely named “Apopathodiaphulatophobia,” or, in literal terms, an intense, irrational fear of constipation. There isn’t much about the track that hasn’t been expressed already, though I’d simply think of it as a solid summation of each working element throughout the album. The underlying straightforward riffing works in the tracks favor, and I also appreciate how Serre takes one of the normally background features—the glitchy ‘seasoning,’ as it were—and implements it as melodic accompaniment to the riffs. Equal in force and succinctness is “Vou Te Foutre,” a thunderous clash of harpsichord glory. Its drums have an interesting presence about them, as they charge at a bullet pace, while even their fragmented state proves impactful. The penultimate “Robert” expounds on the fragmentation aspect, featuring a mostly speed driven showcase before slowing to a grungy dubstep. Its latter melody is thickly coated in distortion, all the while the percussion reverts into a metallic, but naturalized stomp. After each passing phase, the instrumentation increases in clarity before halting on a lone snare. The final track, fittingly titled “Au Revoir,” is certainly the album’s definitive capping point. A grand finale by all accounts, Serre working to harness as wide a spectrum of influences, and doing so without cluttering the canvas. Amid the diversity of the instrumentation, the threads that hold the music in place are especially audible. While each element—piano, violin and guitar—are initially separate, their eventual united form is executed extremely well. From the 3:53 mark onward, the experience is akin to viewing the tracks inner workings through a high-powered microscope. Both the crispness of the acoustics and tonality of the electric are shown to their full potential, and that accumulation encourages me to restart the album from the top, gleaning deeper understanding upon further listening. Overall, Savage Sinusoid is the sixth piece of proof that Serre shows no signs of stagnation. It seems that with every two-year lapse, a refined, engaging, and indeed, more poignant permutation of Igorrr emerges to astounding success. This album is without exception, as its eclectic hybrid of rugged riffs, blistering drums, classical complexity meticulous electro coding—pronounced by a splash of sheer fun—can remain wholly influential for years to come.